Here is a selection of my thoughts on Kindergarten Cop. This is probably one of my favourite Arnold Schwarzenegger roles of all time. Seriously. His performance in this is a riddle wrapped in an enigma wrapped in a hard-boiled policeman wrapped in a kindergarten teacher. And his comic timing isn’t too bad. But upon rewatch, I was confronted with two main thoughts. Firstly, I can’t believe my mother allowed me to watch this as a child. We even had it on VHS. There’s heaps of violence, references to drug use, and ‘adult themes’ such as domestic violence. Secondly, who is even the audience for this? It’s a mix of gritty crime drama plus slapstick-y jokes plus romantic comedy, combining the above mentioned darker themes. At times, it’s a confusing viewing experience. But you can’t go past Schwarzenegger, who really goes commit to his role as the very Austrian John Kimble, with the least Austrian sounding name in the entire universe. There is also absolutely nothing better than the cheesy 90s sitcom score by Randy Edelman. If you think the score sounds like that of the 90s canine classic Beethoven (1992), then you’d be right, since Edelman scored that film as well. 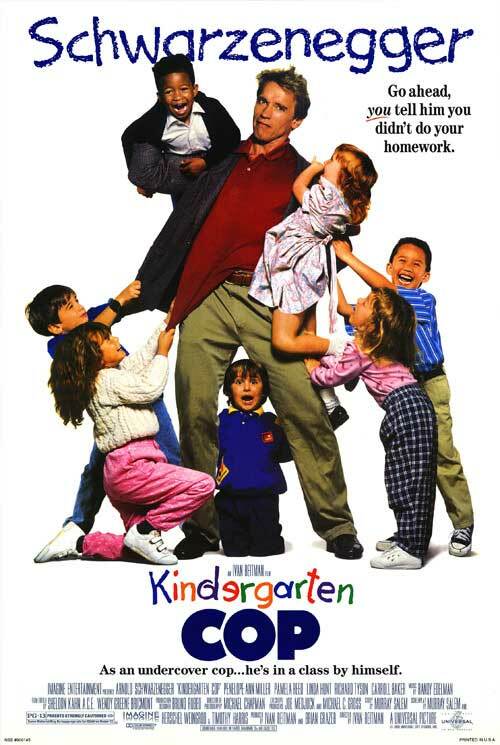 Ultimately, Kindergarten Cop is probably one of those films you can put on for a laugh and just enjoy without thinking too hard. Just shut your brain off and enjoy the funny jokes and moments of genuine suspense, and have a laugh at this impossibly huge Austrian man attempting to control an army of four year olds. I am not an Arnie fan but this film is a lot of fun and it is so quotable. I think it’s a great idea to watch films from your childhood to see how you feel about them now. I remember ‘light bulb’ moments when I watched Grease as an adult and understood all the sexual references haha. Thanks heaps Emma! 🙂 I’ll never forget finally watching Grease as an adult and actually understanding all the sexual references that went totally over my head as a child, kind of disturbing really! Yeah, with the amount of GTA V most kids play nowadays, I’m sure they’d find this one very tame in comparison! Your comment that you can’t believe your mom let you watch this is the same thought I have basically every time I re-watch a childhood favorite haha. This one is definitely on the list! Oh yeah, I can’t believe my mum let me watch this one, and also Speed, which is surprisingly more violent than I remembered! The 90s was a good time. Sadly I STILL quote the hell out of this movie. But the quotes are so great! Yay! Kindergarten Cop was th Password!! I know I know u’ve had plenty of these already, but how else can I THANK YOU for such an amazing blog? Haha! Thanks heaps Brad! 😀 Made my day!